Cottages at Autumn Lake is an active lifestyle community located in historic Savannah, Georgia. This gated community is situated next to a nine-acre freshwater lake with a pavilion, walking trails, and a clubhouse, all surrounded by picturesque views. Construction began in 2016 on the 80 low-maintenance villas and attached homes in the neighborhood. The homes feature open floor plans, high ceilings, and a variety of floor plan configurations. Located just over ten miles from the city center, residents enjoy an ideal location with plenty of daily conveniences nearby. Residents enjoy spending time at the community's clubhouse. Inside, there is an exercise room, billiards table, and plenty of space for social functions. Outdoors, a pool and patio offer a beautiful and scenic view of the nine-acre freshwater lake. A large pavilion along the lake is an ideal location for outdoor gatherings while a walking trail through the community is perfect for enjoying the scenery. Cottages at Autumn Lake includes a total of 80 homes, offering both attached and single-family options. The community’s two floor plans range in size from 1,950 to 2,600 square feet with three to five bedrooms, two or three bathrooms, and attached two-car garages. The Napa floor plan is utilized in both the duplexes and free-standing villas, while the Sonoma floor plan is exclusive to attached properties. The more flexible of the two options, the Napa is either built as a single-story home or with an optional second-floor that adds two extra bedrooms and another bathroom. Both models have first-floor master suites with high-ceilings and lots of available customizations, including upgraded master-bathrooms and screened-in porches. 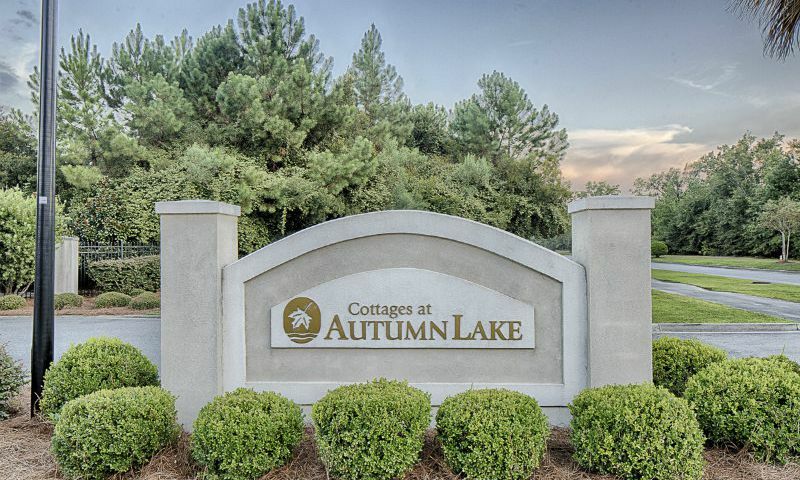 Residents enjoy life at their own pace at Cottages at Autumn Lake. The clubhouse is a center of activity where residents can keep up an exercise routine using the exercise room or plan a social gathering using the multi-purpose room and kitchen. Outdoors, homeowners can enjoy a refreshing dip in the outdoor pool or just enjoy the view from the community's patio. The walking trail is perfect for a morning jog or evening stroll. Residents have lots of time to enjoy the activities they love knowing that the homeowners' association covers community maintenance, trash pickup, pest control, and lawn care. Cottages at Autumn Lake is located near the Atlantic coast in Savannah, GA. Routine shopping trips are easy with a Kroger, CVS, Walgreens, and several banks and restaurants located just under two miles away along Ogeechee Road. The surrounding area is a golfer's delight offering an impressive 14 courses within 20 miles, and even more options can be found just 30 miles away in the Hilton Head Island area. The famous sandy beaches of Tybee Island are 26 miles from the community as well, making for an easy day trip. The historic city center of Savannah is roughly twelve miles from Cottages at Autumn Lake and is among the largest National Historic Landmark districts in the country. Famed for its architecture, oak trees, and southern hospitality, Savannah is a year-round destination for tourists and history-buffs. When long-distance travel is required, Savannah/Hilton Head International Airport is 15 miles away, with Interstates 16 and 95 easily accessible from the community. Homebuyers seeking a low-maintenance community surrounded by the southern charm of Savannah, GA will certainly find a lot to love about Cottages at Autumn Lake. Check back soon for more information on the lifestyle in Cottages at Autumn Lake. Cottages at Autumn Lake includes a total of 80 homes, offering both attached and single-family options. The communitys two floor plans range in size from 1,950 to 2,600 square feet with three to five bedrooms, two or three bathrooms, and attached two-car garages. The Napa floor plan is utilized in both the duplexes and free-standing villas, while the Sonoma floor plan is exclusive to attached properties. The more flexible of the two options, the Napa is either built as a single-story home or with an optional second-floor that adds two extra bedrooms and another bathroom. Both models have first-floor master suites with high-ceilings and lots of available customizations, including upgraded master-bathrooms and screened-in porches. 55places.com is not affiliated with the developer(s) or homeowners association of Cottages at Autumn Lake. The information you submit is distributed to a 55places.com Partner Agent, who is a licensed real estate agent. The information regarding Cottages at Autumn Lake has not been verified or approved by the developer or homeowners association. Please verify all information prior to purchasing. 55places.com is not responsible for any errors regarding the information displayed on this website.